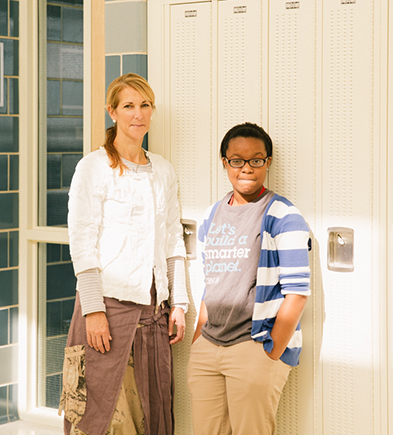 Velma, an 11th grader at the Sarah E. Goode STEM Academy in Chicago, IL, and her mentor, Jill Sherman, an Art Director at IBM, have forged a meaningful relationship over the past two years. The pair, who communicate both online and in-person at school events, have talked about everything from the challenges of high school and college to future careers and what it take to be successful. Velma, how has having Jill as a mentor helped you? Velma: Jill is someone outside of my teachers and other adults in my life whom I can go to, and she will listen without being biased. Jill is a great at giving me advice. It’s also nice to be able to tell Jill when I have an idea, and it’s great to actually tell Jill what I want to be and then get guidance about it. Right now, Jill and I mostly talk about college and career topics. Jill is awesome! Jill, what do you offer to Velma? Jill: What’s nice is that Velma really utilizes me as a resource. A lot of what we talk about now is college; Velma has her sights set on UCLA. I try to be a positive influence in her life by just listening. My goal is to give Velma unbiased feedback. I talk to her about her interests and listen to her ideas. Velma is smart and dedicated and can come up with the solutions on her own. When she wants advice, she asks. Velma, has Jill given you a different perspective on the world of work? Velma: I’ve gotten the chance to learn a lot about what Jill does. She travels a lot, which is exciting to me. Obviously, she gets to be creative. But she also has important projects with clients and has to meet deadlines and help the people that she manages meet deadlines. She’s told me the importance of being professional under pressure and about how you have to step out of your comfort zone to grow. STEM Academy, have been working together for three years. Jill, what has impressed you most about getting to know Velma over the last two years? Jill: Velma told me at first that she wanted to be a screenwriter. 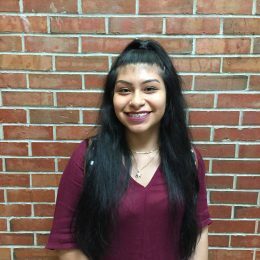 But now that she has taken some STEM-based classes and will have her associate degree, she wants to be a thoracic surgeon. That is phenomenal to me! I don’t know that I would have looked at medical school at her age. I am most impressed by Velma’s energy and commitment to getting college classes in early. She has made sacrifices and it hasn’t been easy, but she has great aspirations. Velma also sees the value of being a mentor to others in turn. Velma has really stepped up as a leader to show the new classes of students the ropes. What has been the key to having a successful mentoring relationship? Velma: This is a two-way street. If I communicate and you communicate, there is automatically a connection. If you communicate enough with someone, you find something you both have in common or that you can help each other with. Jill: I agree with Velma. Velma and I keep the communication channels open. We have an open dialogue about her classes, where she is with college. We keep it aspirational. It’s good to have a sounding board for your ideas and then talk about the pros/cons. She’s told me the importance of being professional under pressure and about how you have to step out of your comfort zone to grow. Where do you see your relationship in ten years from now? Velma: I still see Jill as my mentor, of course! I also see the relationship growing. I see going to her for advice or even her coming to me for advice. If I gave a speech, I would thank her for the impact she’s had on my life. Jill: I think as she goes on along her pathway – our relationship will change – we’ll become colleagues and, yes, Velma may be giving me advice! 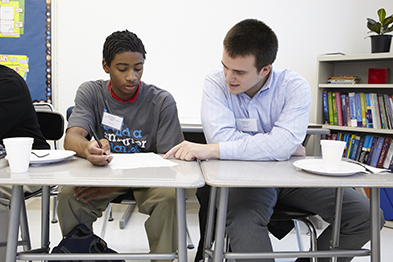 If there was something you wanted everyone who was starting a mentor program at a 9-14 school to know, what would it be? Jill: I would ask volunteers to pause and think about all the mentors who had an impact in their lives. When I work with Velma, I think about all the mentors I had from junior high through college and up until now; some you have for a short period of time in your life, some mentor you forever, but each add something of value. This is a win-win for everyone involved. Velma: It’s great to be able to have someone who encourages you to have an open mind about what you want to do in your life; a mentor is that someone you can always go to for advice; it’s just a great thing for kids to have and for the mentors to have also; and basically everything Jill said! partnership at P-TECH 9-14 schools.